Changzhou Shentong Protection Equipment Co., Ltd. The x-ray protective lead door was also named CT room door or radiation protection lead door. 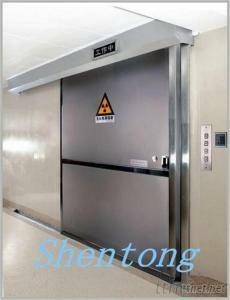 The radiation protection sliding door is one of high-tech ionizing radiation protection products. The product features excellent radiation protection performance, reasonable door structure, smooth door opening/closing, novel and elegant appearance, as well as perfect match between visual effect and high-quality medical equipment. Our x ray lead door is widely used for radiation protection in CT rooms of hosopital, ASA equipment rooms, x-ray equipment rooms, C-arm equipment rooms, DR equipment rooms. The surface of the lead protection door use the high quality 304 stainless steel, not only make the door beautiful but also increased mechanical strength of the door. The lead door protection door specially have stainless steel hand handle and fire prevention locks. Fire prevention locks melting temperature more than 1900 degrees, safe and durable. Easily cope with the frequent use of the public hospital requirements! The radiation protection logo would sign on the lead protection door and above the door it will have an indicator lights to remind the workers to pay attention to the radiation protection. The metal lead plates are fixed in two ways: mechanical fixing and pressure bonding, to make sure that the lead plates will not get lower and fall off. The flat-open protective lead doors are specifically designed with pressure bearings of particular types, which make the door flexibly, switch and produce no noise. The push-draw protective doors are designed with mute tracks of ground rack, and there are guide bearings on the doors, and thus it is very flexible and noiseless when switching the door. The main body frames of these doors are welded by the steel square tubes 30mm*50mm from an angle of 45°, and are pasted with medical metal lead plates on both sides (the lead content of the medical metal lead plate’s reaches 99.99%). The protective covering is of argon arc welding, and there is no aperture on the covering, to make sure that the radiations will never leak. Health & Medical, Medical Equipments/n.e.s., Medical Equipments/n.e.s.